Mirehouse in Whitehaven struggles with lack of employment, poor educational attainment, health and income deprivation, poor housing and loneliness. However, volunteers at the local community centre are helping to raise the aspirations of residents in the area by providing activities and workshops, which also address social isolation. Mirehouse Community Centre offers activities and trips for youngsters, employability courses and a DIY workshop called the Men in Sheds project. Compared with women, men are at greater risk of isolation and loneliness. Older men are more likely to be socially isolated than women of a similar age due to less contact with family and a greater reluctance to join clubs or ask for support. Originally set up by Age UK West Cumbria, the Men in Sheds project provides men aged 50 or over with a dedicated space where they can share tools, skills and socialise in the company of others of a similar age. Almost 40 men, some with mental health issues, attend the weekly sessions to work on projects such as wooden wine holders, recycling boxes, children’s toys and bird and bat boxes in a safe and inclusive environment. The project not only provides a space for men to get together, they also learn skills which help with employability and can complete online accredited vocational courses. £5,784 from the Shepley Group Grassroots Fund, Stobbarts Ltd Grassroots Fund, Doosan Babcock Grassroots Fund, Fryer Grassroots Fund and the Brian & Ann Clark Fund contributed towards the wages of a project worker, tools and equipment. Katrina MacEwan, Development Lead, said: “The project makes an enormous difference to the men who benefit, and to the volunteers and carers, who either attend and join in the fun, or are given a few hours respite. 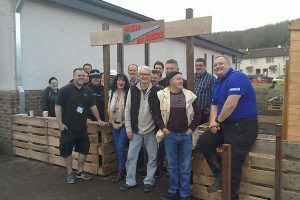 Following the success of the Mirehouse shed, the Copeland Hub, a multi-agency approach to tackle issues in the area began supporting the development of the Men in Sheds project in 2016 to offer additional activities and increase capacity. It aims to roll it out to the rest of the borough through the introduction of a Copeland Shed Network.